YouTube officially rolled out its new interface to the public few days ago, August 29th 2017 to be precise. This was done after months of being in the beta testing. 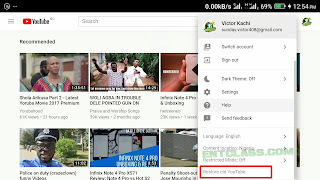 If you are a regular YouTube user, you would have noticed that the new interface is now set as the default UI for everyone. Though there have been bad reviews regarding the new interface. If I should add, i just don't like the current UI of YouTube PC view. The interface is just dull with small or no design. It's just unpleasing to the eyes and very confusing. The current design has no option to look at views stats (i.e: how many viewing the video has got over time) in the video description and more other missing features. The likes/dislikes bar looks like the ratio of dislikes is super high. Difficult to playlist video from a specific video. Video manager is located at a hard-to-find place. What ever your reasons are, the good news is that you can always go back to the old Youtube layout, and the bad news is, we don’t know how long this option will be available before they make the new UI permanently default. In this article, I will quickly guide you on how to Restore the Old YouTube layout. Kindly read on. 2. Click on your user icon located at the top right corner of the screen. 3. 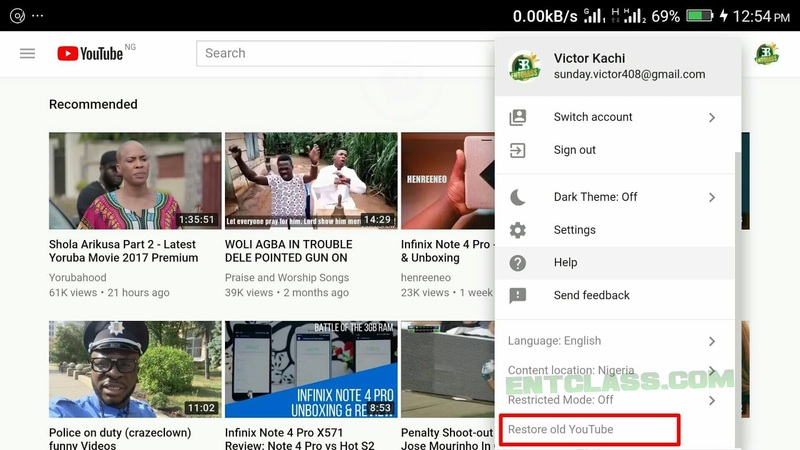 Click on “Restore Old YouTube”. 4. Provide a reason why you’re going back. And that’s it, YouTube will restore back to the old layout. But if you still feel you want to go back to the new layout, simply go to youtube.com/new and you’ll be presented with the new Layout. Hopefully, the new layout might still get a better design and features in the future. Love entclass.com,thanks for sharing this. Hello Kachi... I'm having one serious issue with my Glo sim.... I can't On my data when I do not have a data plan... But when I loaded Card and purchased A data plan, the Data just come Alive. Pls what's the way out?? There's no way for now. That's how Glo wants it. Maybe to stop every free browsing cheats. Kachi, is everybody facing this same issue? It's a good thing sharing this with us, it would help some people.